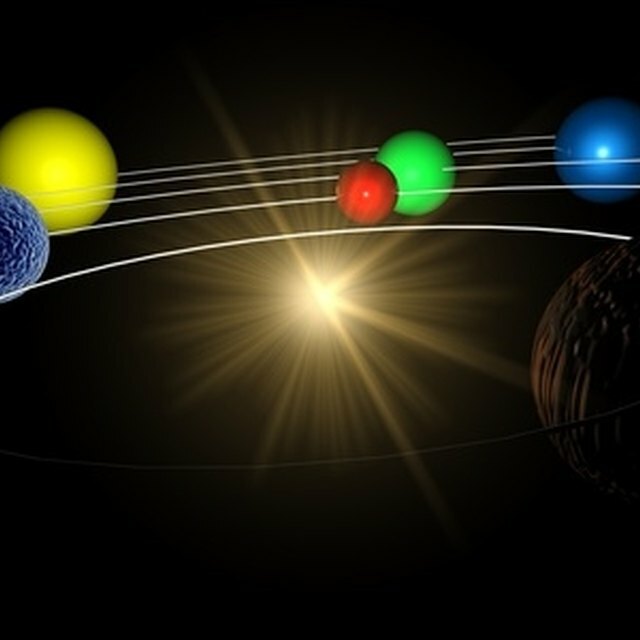 The solar system consists of the sun plus eight planets. At one point, it was viewed as having nine of them, but in 2005, Pluto was reclassified as a dwarf planet. A dwarf planet is a body that orbits around the sun but shares its orbit with other celestial bodies. 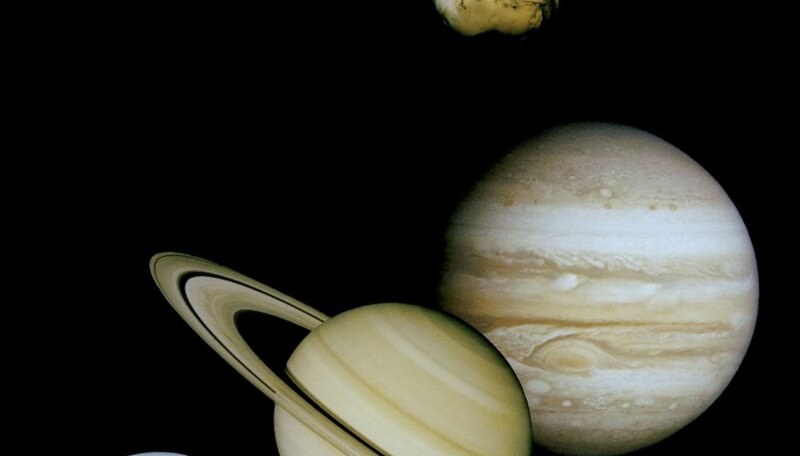 The solar system has several other dwarfs in addition to Pluto. It also has other bodies, such as moons, comets, asteroids, ice and rocks. To make a 3-D solar system, place Styrofoam balls onto a sheet of cardboard. Attach a piece of string to the cardboard’s corners, in order to hang it. Select a sheet of cardboard large enough to hold the eight planets. One suggested size is a 20-by-20 square, which can be made by taping two sheets together. Paint the cardboard black. After it is dry, use chalk to draw a 3-inch circle in its middle, to create a placeholder for the sun. Create a series of concentric rings around the circle. The rings should be 2 inches apart. Lightly mark the places on the circles where the planets will be placed, using the solar system picture as a guide. Select a 2.5-inch Styrofoam ball to represent the sun, and a 1.5-inch ball for Jupiter. Use 1-inch balls to represent Saturn, Uranus and Neptune. Choose 0.5-inch balls for the Earth, Mars, Venus and Mercury. Create Saturn’s ring. Cut a Styrofoam piece into a circle that is 1.5 inches in diameter. Remove part of the middle part so that it forms a ring. Glue it onto the middle of a 1.0- inch Styrofoam ball. Paint the Styrofoam balls. Choose yellow for the Sun and for Venus. Paint Mercury orange and Mars red. Choose green and blue for the Earth, and green and dark blue for Uranus. Paint Neptune sky blue. Finally, paint Jupiter yellow and brown, and Saturn brown but with a yellow ring. Attach the balls to the cardboard. One way to do this is to cut holes in the cardboard, and then push the balls halfway through them. Add glue to make sure that they stay in place. Another way is to cut each Styrofoam ball in half, and then glue one of the halves to the cardboard’s surface. For Saturn, line the ring so that it is flush. After using either method, repaint any areas that need them. Create two holes on each side of the cardboard. Thread a piece of string through both of them. Hang the cardboard solar system on a hook. Use little dots of white paint to represent moons and other celestial bodies. To create the circles without a protractor, tie a string to a piece of chalk. Place a finger on the end of the string, and use the other hand to move the chalk in a circle. Lewis, Kim. "How to Make a Hanging 3D Solar System." Sciencing, https://sciencing.com/make-hanging-3d-solar-system-12113254.html. 24 April 2017.